Death Note is like Breaking Bad in the way that you root for the main character, but then their morals become ambiguous. It focuses on Light Yagami, a student who finds a notebook owned by a Shinigami (a god of death) called a Death Note. And with this Death Note one can write the name of a person, their cause of death, and their time of death and that’s the way they’ll die. And just when you think it can’t get any crazier, there’s a detective known as L that’s on their trail who is known as the greatest detective in the world. You will watch this one on the edge of your seat. Devilman Crybaby is an acid trip of a show. It’s based on childhood friends Akira and Ryo and their pursuit to expose the existence of demons to the world with the hopes of stopping them. And the exposing them part does happen…it just doesn’t end the way you would think. Bleach is a CLASSIC anime based on Ichigo Kurosaki, a high schooler who gains the powers of a Shinigami through Rukia Kuchiki, who is already a god of death. He takes on the task of defending humans from evil spirits with his newfound powers and it’s seriously one of the best anime series ever. Based on the classic ’80s video game, Castlevania is an amazing adaptation of the franchise. It provides depth to the series’ villain, Dracula. And is filled with smooth actions sequences and just overall gorgeous character designs. One-Punch Man is a hilarious action anime that comes from the webcomic of the same name. It takes the concept of skilled fighters wanting to become the best in the world and deconstructs it. The main character Saitama is already the strongest person in the world that defeats all his opposers with one punch. He’s on the search for someone or something that can give him a run for his money. Fullmetal Alchemist: Brotherhood is a retelling of the first Fullmetal Alchemist series, but with better animation. And this time it follows the manga to a T. The original FMA is available on Netflix and so is the live-action movie, but Fullmetal Alchemist: Brother is the perfect one to start with. The Seven Deadly Sins is an action-packed yet lighthearted anime filled with amazing fighting scenes. The main character Meliodas will remind you of Master Jiraiya from Naruto or Master Roshi from Dragon Ball for obvious reasons. OHSHC is a romantic comedy that focuses on Haruhi Fujioka, a student at the very wealthy high school. He joins a host club full of rich kids that throw parties for women. The Disastrous Life of Saiki K. is about Kusuo Saiki, a high school student with psychic powers. But the thing he wants most is some normalcy. It’s hilarious and every episode is a story within itself. Which makes it very easy to binge-watch or play in the background without getting lost in the story. Soul Eater is quirky as hell. The sun and moon have full faces, souls get personified as something you can actually eat, and the lord of death has a son that’s enrolled in his school where in order to graduate you have to collect 99 evil human souls and one witch to graduate. Fairy Tail takes place in a town where everyone uses magic for just about everything. But the story focuses on Lucy, a girl that’s set on becoming a wizard and joining the Fairy Tail guild. The character designs are intricate and memorable and the fight scenes are intense, especially in comparison to the lighthearted nature of the town and friendships formed between Lucy and Natsu, who by the way is a dragon slayer. The action in Blue Exorcist feels like it’s being shot by someone with a handheld camcorder trying their hardest to keep steady. It’s so damn good. It’s extremely fast-paced, similar to the way the storyline is. There’s rarely any dull moments. Attack on Titan can be best described as heart-wrenching and nail-biting. It’s about a town that’s just trying to live in a world filled with giant humanoids that are 50 feet tall. It is seriously intense. Don’t watch if you’re faint of heart. Gurren Lagann is a beautiful, corny masterpiece. It’s corny in the way that it’s overly motivational and inspirational, but that’s what also makes it beautiful. It feels genuine. It follows the ever so heroic Kamina, his “brother” Simon, and the badass Yoko. It’s sneaky because you really grow to love the character because the story takes place over a long period of time. Kill la Kill is SO exaggerated it’s perfect. It never really lets up on intensity which is instantly engaging. And each episode maintains a perfect balance of action and comedy. Your Lie in April is a romantic drama that will probably make you cry. It’s based on Kousei a piano prodigy that’s lost his passion for music and Kaori a skilled violinist that revives the love he had through her passion for music. B: The Beginning is a really suspenseful anime that circles around a serial killer, Killer B, the Royal Investigation Service, and the many crimes they solve throughout the town. Gunslinger Girl is an amazing watch if you like sci-fi and violence. The main character, Henrietta is a badass. Don’t let the name fool you, she has more depth than the title suggests. Gun slinging is definitely her “thing” though. Puella Magi Madoka Magica is a dark sci-fi anime that’s animated beautifully. It’s often revered as unique for how it takes the genre of Magical Girl and flips it on its head. Expect the unexpected. If cel animation is what you prefer, then AJIN: Demi-Human is not for you. It is done completely in CG which is sometimes hard to get into with anime. It’s “OMG! !” violent, but the storyline is awesome. It’s based on the character Kei who discovers he’s an Ajin (demi-human) after reviving himself from death. He is on the run from a corrupt government that has been trying to capture Ajins and use them for profit. 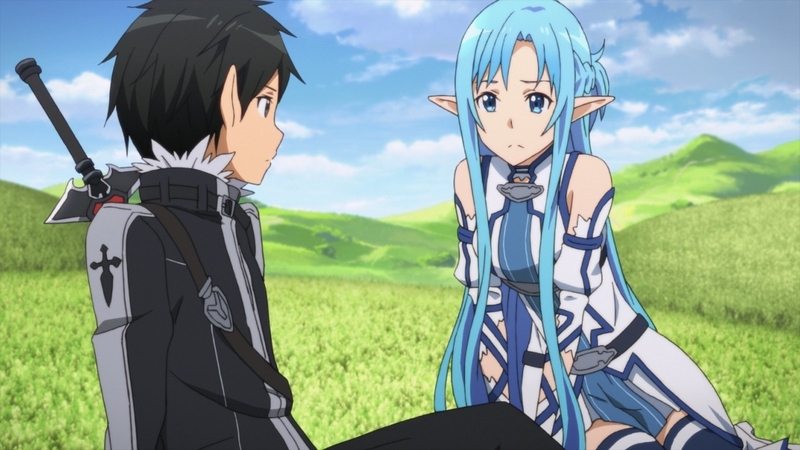 Sword Art Online is unique in the way it kind of skips from genre to genre throughout the series. It’s true crime one second, fantasy the next, and a love story all in one episode. It kind of lays the love on heavy, but the idea of being stuck in a VR world for two years probably needs something to lighten that load. The animation throughout this adaptation of the classic series is amazing, if you’re not already familiar with the storyline it might be a little confusing. But Google is your friend.